For two months, over the thunder of machines at the steel mill, the men taunted Mubeen Rajhu about his sister. Even now, they laugh at how easy it was to make him lose his temper. Some people had seen Tasleem in their Lahore slum with a Christian man. She was 18, a good Muslim girl, out in public with a man. Even though the man had converted to Islam out of love for her, this couldn’t be allowed. Raza can barely contain a smile as he talks about the hours spent needling Rajhu. “He used to tell us, ‘If you don’t stop, I will kill myself. Stop! '” Raza says. He raises his voice to compete with the sounds of the coal-powered mill, and workers blackened by its dust gather to listen. They too smile. A few laugh at the memory of Rajhu’s outbursts. “The guys here told him, . ‘It would be better to kill your sister. It is better than letting her have this relationship,'” Raza says. Rajhu told them he had bought a pistol, and one day in August he stopped coming to work. Rajhu discovered that his sister had defied the family and married. For six days he paced. His rage grew. How could she? He watched her laughing on the phone, ignoring their mother’s pleas to leave the man. On the seventh day, he retrieved the pistol from where he had hidden it and walked up to his sister and with one bullet to the head, he killed her. For generations now in Pakistan, they’ve called it “honor” killing, carried out in the name of a family’s reputation. In the vast majority of cases, the “honor” killer is a man and the victim is a woman. She is a sister who falls in love with a man not of her family’s choosing. She is a daughter who refuses to agree to an arranged marriage, sometimes to a man old enough to be her father. She is a wife who can no longer stay in an abusive marriage and divorces her husband. He is a brother, like Rajhu, who cannot bear the taunts of other men brought up as he was, believing that women are subservient and must be kept in the shadows, their worth often measured by the number of sons they can produce. He is a neighbor, like Raza at the plant, who doesn’t think his friend did anything wrong in taking his sister’s life. He is a father, like Tasleem’s, who is angry about her killing not because she is dead, but because her death will reveal her “shame” to other members of the family and beyond. As modernity pushes against tradition, Pakistan has seen an increase in the number of women and girls killed in the name of honor: last year, 1,184 people died, only 88 of them men. The year before, the figure was 1005, and in 2013 it was 869, according to the independent Human Rights Commission of Pakistan. The true numbers are believed to be higher, because many cases go unreported. The killings have fueled a growing public outrage at the practice, and a chorus of voices saying that there is no honor in killing – only dishonor. They are working to close the legal loophole that lets killers go free. A proliferation of television channels and newspapers has brought the horrors of girls strangled, burned alive or shot in the head out of the secrecy of the home and into the public. But for many who have been fighting this kind of killing, it is the mindset of the boy who could kill his sister, or the parent who could kill a daughter, that has to be understood and changed. The shackles that Rajhu wears look too heavy for his slender wrists. They make the harsh sound of metal clanking against metal, reverberating in the silence that punctuates his conversation. For more than a month, he has been held at the police headquarters in Lahore. He tells his story in a sparsely furnished office. His minders have left; he is behind closed doors, out of sight and earshot of police. Rajhu says he loved his sister, a quiet young woman who had never before rebelled against her family. He gave her a chance, he says. “I told her I would have no face to show at the mill, to show to my neighbors, so don’t do it. Don’t do it. But she wouldn’t listen,” he says. Rajhu, who thinks he’s 24 but isn’t sure, occasionally wavers when he tells his story, revealing a hint of remorse. It is brief, however; only when he speaks of her as a child is his voice soft and his gaze somewhere in the distance. He helped raise her, he says, fleetingly seeming to wonder at how things had gotten so out of control. Toying with the chains that bind his hands, he fidgets as he remembers the taunts. Then his eyes harden and his voice becomes steely. His anger grows as he talks about the day his sister married the Christian. It was the same day their grandmother died. Tasleem said she was going to buy medicine, and his younger brother was sent with her. They were gone a long time. The next day Rajhu grilled his younger brother, beating him until he confessed that Tasleem had married and he had been a witness. “He was right there in court when they married,” he says, as if he still can’t believe it. Tasleem returned to her parents’ home because she wanted them to accept her new husband, Rajhu says. For one week she stayed, talking every day to her husband, planning their reunion. Rajhu remembered the taunting. His anger grew. On Aug. 14, Rajhu got his gun. Tasleem was sitting with her mother and her sister on the cracked concrete floor of their family kitchen. The Rajhu family lives in a dirt-poor neighborhood on the northern edge of Lahore where water buffalo compete with cars for space on mud-clogged roads. Swarms of mosquitoes hover over vast pools of putrid-smelling, stagnant water left behind by monsoon rains. At the entrance gate to his brick shack, the siblings’ father, Mohammed Naseer Rajhu, peeks out, reluctant to admit visitors into his cramped home. The rooms are so small there is barely space for a rickety wooden bench and the traditional rope bed where he sits. In the kitchen, Tasleem’s blood still stains the rough wall. He is adamant that his image not be taken either on video or in a photograph in keeping with his interpretation of Islam, which some say forbids human images. He says that is the reason the family has no photos of Tasleem, whom neighbors call a beauty. The only image of Tasleem, her thick black hair falling carelessly over her face, was taken by police after her death. “Never can you show my face. My son killed my daughter to save his face, to not have anyone see his sister’s face, and now you are asking me to do the same thing,” he says. He agrees for a brief few minutes to speak with his head turned away from the camera until even that is too much. His outrage grows — all of it directed at his daughter. 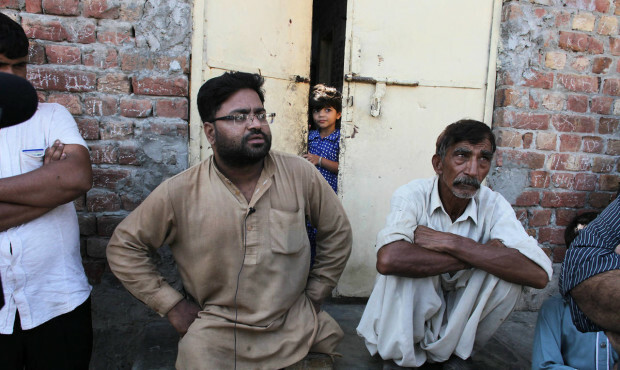 He is angry that his son killed his sister for two reasons only: the young man is in jail and no longer earning nearly $200 a month, and his family, spread throughout Pakistan, will soon learn of Tasleem’s indiscretions. The elder Rajhu weaves a tale of Tasleem’s deceit and deception. He says they discovered she had two mobile phones, swearing he knew nothing of them until after her death, when they also found sleeping pills. He accuses Tasleem of drugging the family, putting powdered sleeping pills in their tea so she could sneak off at night to meet Jehangir. His tale of conspiracy rings hollow. He is unable to explain how she could be so surreptitious in a home without doors and only a curtain concealing a small bathroom. He sees his family as victims of Tasleem’s deception. Later, sitting on the broken steps of his neighbor’s home, he nods firmly as his neighbors heap praise on the boy who killed his sister. After his son killed Tasleem, the elder Rajhu went to the police and filed a complaint. In Pakistan, parents often do so not to see the killer punished, but to lay the legal groundwork so they can forgive the culprit — a legal loophole that activists are fighting. He wouldn’t explicitly say he forgives his son, but it is clear that he thinks the young man had every right to kill his sister. Not everyone agrees – women in particular. Down the dirt street, Fauzia Javed runs a hole-in-the wall shop selling penny candy and biscuits. She knows too well the double standards of her society. The man Tasleem married, Jehangir, fled the night she was killed. The gate to his home, barely a block from Tasleem’s, is padlocked. But the fallout from his love for Tasleem has engulfed the members of the small Christian community living in the area. Earlier this month, just weeks after the killing, gunmen fired shots into their homes. No one was hurt, but no one has slept well since. In this majority Muslim country, Christians make up barely 5 percent of the population and in recent years have come under increasing attack by militants, who insist all non-Muslims are unbelievers. Yet Pakistan’s minorities, including Christians, are protected in the country’s constitution. Jehangir’s cousin Abbas Ainat doesn’t smile much and when he speaks, he is matter-of-fact. Rajhu’s jailors return. It is time. He must return to his cell to prepare to be taken the next day to Lahore’s Kot Lakput prison, where he will await trial. Darkness has settled on the sprawling police station that was humming with activity when Rajhu began his story. A policeman grabs hold of Rajhu’s chains to lead him down the concrete stairs. His father is hanging behind in the shadows. He has been waiting. He comes to his son’s side. Tasleem was just 18 years old when her brother shot her in the head. Her crime was marrying a man of her choice, considered a betrayal of a family’s honor among many in Pakistan who live by an ancient code of conduct. Last year, three people a day were killed in the name of “honor” in Pakistan: a total of 1,096 women and 88 men, according to the independent Human Rights Commission of Pakistan, which says the true figure is likely higher because many such crimes go unreported. In 2014, the number was 1,005 women, including 82 children, up from 869 women killed a year earlier. Outrage at the practice has grown in recent months as Pakistani news channels have reported on girls who are shot, strangled or burned alive, most often by a brother or a parent. Pakistan’s conservative Prime Minister Nawaz Sharif has promised to introduce legislation that will remove a legal loophole that allows the family of a murder victim to effectively pardon the murderer. The loophole is often invoked in honor killings to prevent any prosecution. “You will die awaiting justice from a court,” said Mukhtar Mai, who was gang raped and paraded naked through her village as punishment for a perceived insult to the honor of a rival family by her brother. For many of the victims, who are brought up according to a strict interpretation of Islam that doesn’t allow images, their only picture is one take in death.